I LOVE creamy mac and cheeses. Sometimes, when I’m making a baked mac and cheese, I’ll scoop out a little bowl for myself to snack on while the rest is baking in the oven. Confession: I inevitably just end up eating ALL the mac and cheese straight from the pot, no baking required. It’s an endless struggle (roll your eyes, it’s a first world problem, I know!) deciding if I want creamy mac and cheese or baked. The appeal of baked mac and cheese is of course the crispy crunchy, deeply burnished pieces of cheese at the edges of the casserole dish. As delicious as those crunchy bits are, sometimes I can’t wait an hour for my mac and cheese to bake. And of course, there’s something to be said about the smooth, dreamy creamy texture of stovetop mac and cheese. This stovetop mac and cheese recipe has the added bonus of being fast, at least compared to baked mac and cheese. I know that there are some one-pot mac and cheese recipes out there, but I like taking the time to boil the mac separately. 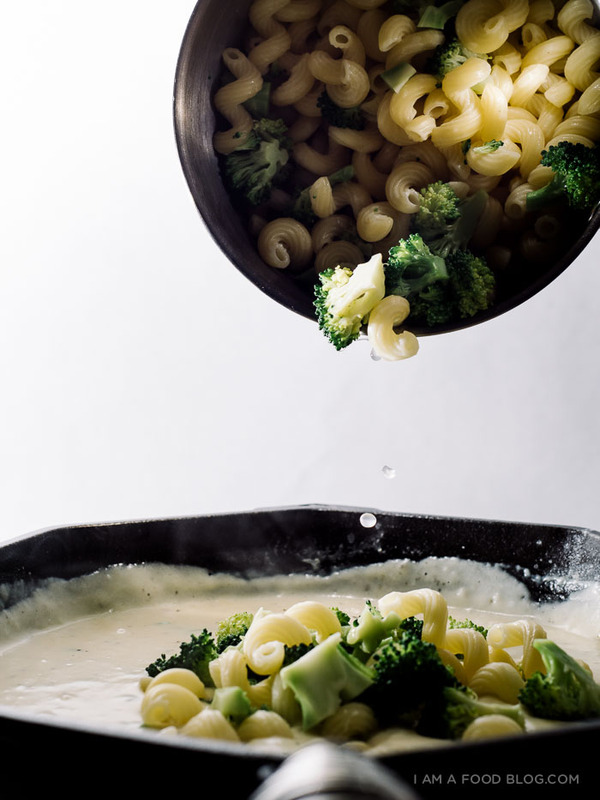 If you’re really trying to cut down on doing dishes/making things easy, you can go ahead and cook your broccoli and mac, remove and drain it, then make the sauce in the same pot you boiled the noodles in. 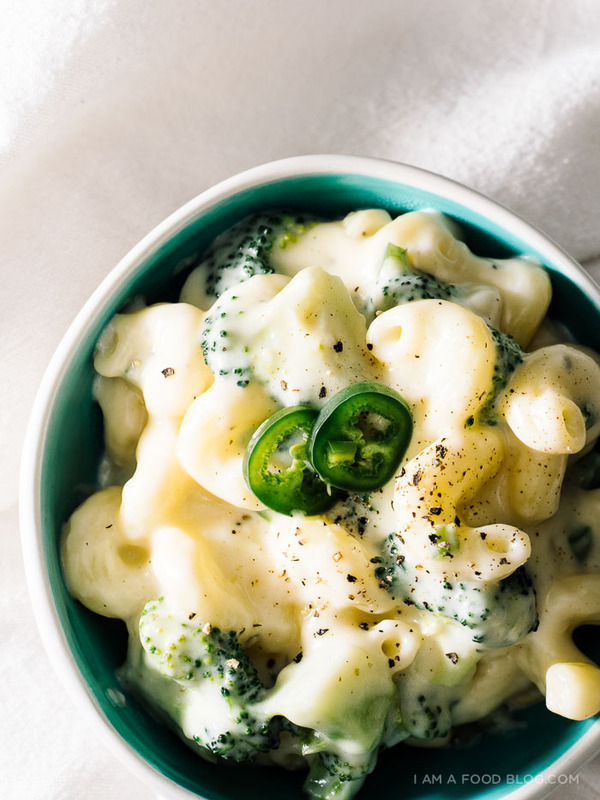 From that point on, all you do is make a simple roux, then toss everything together and you’re sitting down to a giant bowl of creamy, dreamy jalapeño broccoli mac and cheese. It’s got vegetables in it, so it’s totally healthy, am I right?! Boil your macaroni until al dente, according the package. When there is 30 seconds to a minute left on the cooking time, add the broccoli to the boiling water. 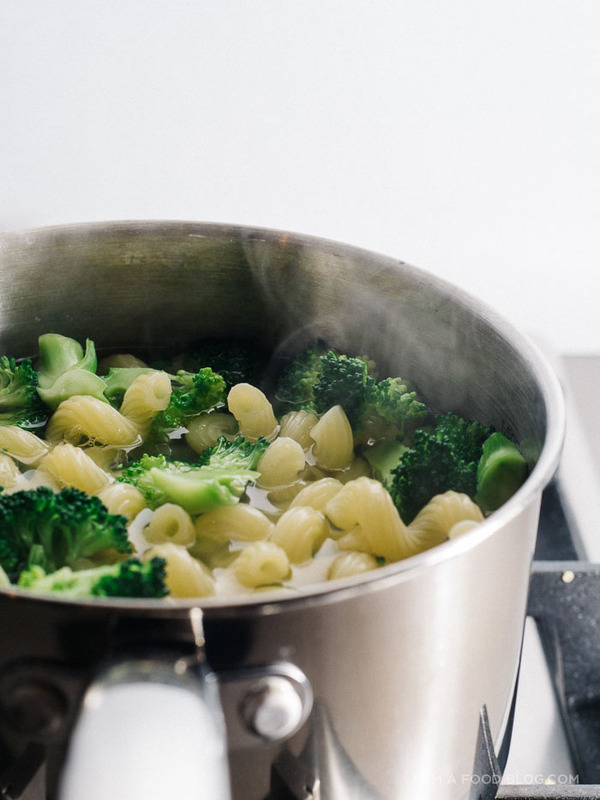 When the macaroni is finished and the broccoli is bright green, drain, rinse with cold water and set aside until your sauce is finished. In the same pot or a large sauté pan or skillet, melt the butter over medium heat. Add the flour and stir constantly for about three minutes, until completely smooth and incorporated. Pour in 1 cup of the milk in a thin stream while whisking. It might start out lumpy, but keep whisking and it will smooth out into a thick paste. Add the rest of the milk and whisk until smooth. Keep on medium heat, stirring occasionally, for about 10 minutes, until the sauce thickens. Remove from the heat and add the salt and pepper, diced jalapeños, and cheese. Stir until cheese is melted. Add the drained pasta and broccoli and gently mix. Taste and adjust seasonings if needed and enjoy hot. Making stovetop mac and cheese at home is so freaking tasty! I’m all over this! That cover photo is absolutely beautiful. And the recipe sounds amazing!! Mine is lucky to last me dipping the vegetables straight into the sauce! The pasta is not quick enough! I love cheese and pasta, so lets hope my will power lasst me long enough next time to get it in the oven. Great recipe and love the creamy texture of your sauce. I am always going to love your photography esp. the first picture ;). It screams “cheese sauce”! Yes, I’m with you. 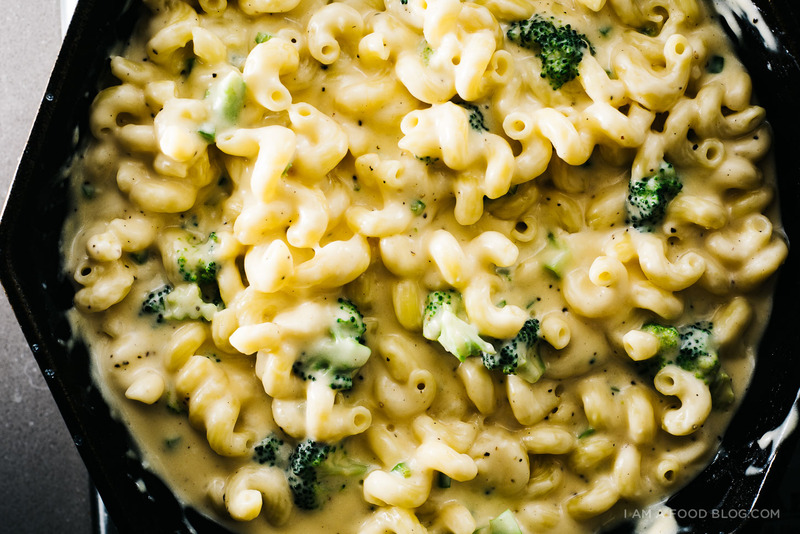 A creamy mac-and-cheese is my favorite, too. And make it into a one-pot dish sounds like a deal! Oooh my this looks so creamy and indulgent!! I love adding veg to my mac and cheese – you should try sautéed mushrooms, I’m sure you’ll love it Stephanie! 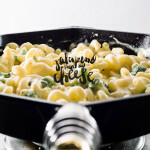 One of the best mac & cheese recipes ever, love this! Mmm, this look so yummy. Creamy cheesy pasta is a big weakness of mine. mine too heather, mine too! uh, don’t jalapeños make EVERYTHING more delicious?! Oh heavens. This mac and cheese looks absolutely amazing. I’m craving warm, cheesy noodles. thanks jenna!! you can never go wrong with cheesy noodles! This looks amazing Stephanie! I’m OBSESSED with your photography….you’re my biggest role model. No joke. Your images are beautiful and have me drooling. 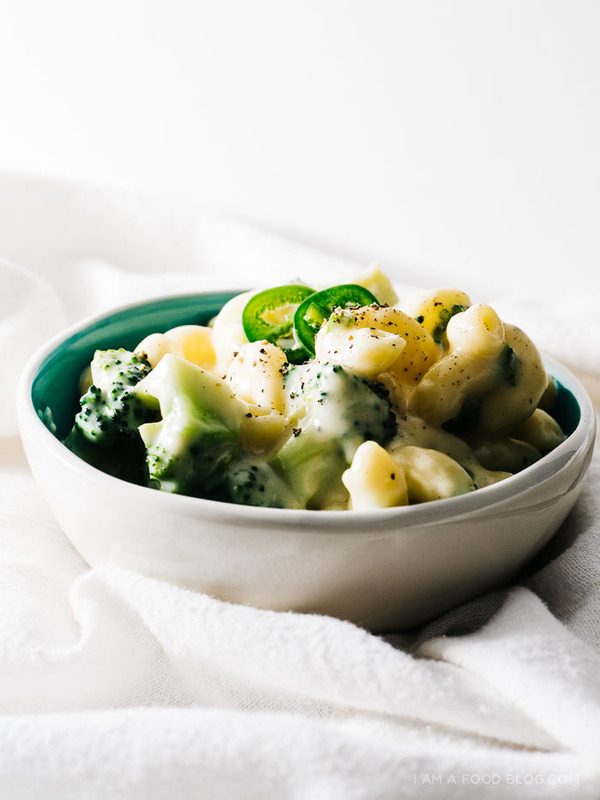 Broccoli and cheese make a great combination and a little heat from the jalapeno just sounds perfect! heehee, more greens for the new year!! and more mac and cheese of course! This is delicious! Thanks for the recipe! Wait eating mac and cheese from the pot is the best thing, though?!!! Haha, this looks SOO good oh my gosh. 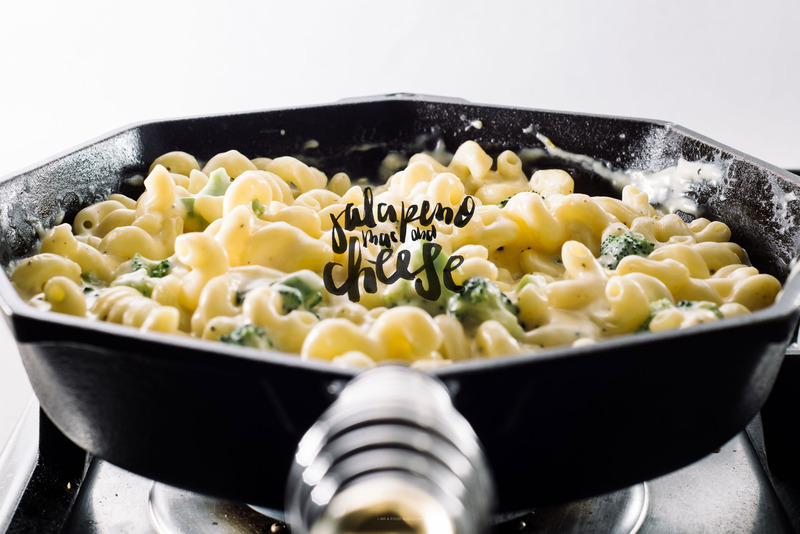 Jalapeno mac and cheese? Cheese + spicy stuff is my fave! I like have the world am a MAJOR Mac and Cheese fan. I love the fact it has been trending the few years. Who would have thought one would find it easily offered in restaurants. The stove top variety here with a zap to it—–GREAT. Hi! Your pictures and recipes are mouthwateringly amazing. I stumbled on your blog today (nice to meet you) and I’ve been browsing from one recipe to the next! I LOVE the institutional-ness of creamy mac + cheese in all it’s cafeteria-days glory. High five, lady! An alternative to baking that would still sort of give you the crunchy top is to brown some Panko in olive oil or butter until all crispy and fold it in. I do that with my cassoulet and it kinds does the trick! I love mac and cheese and sure I will make them. I absolutely love eating macaroni and cheese! It’s one of my favorite foods! 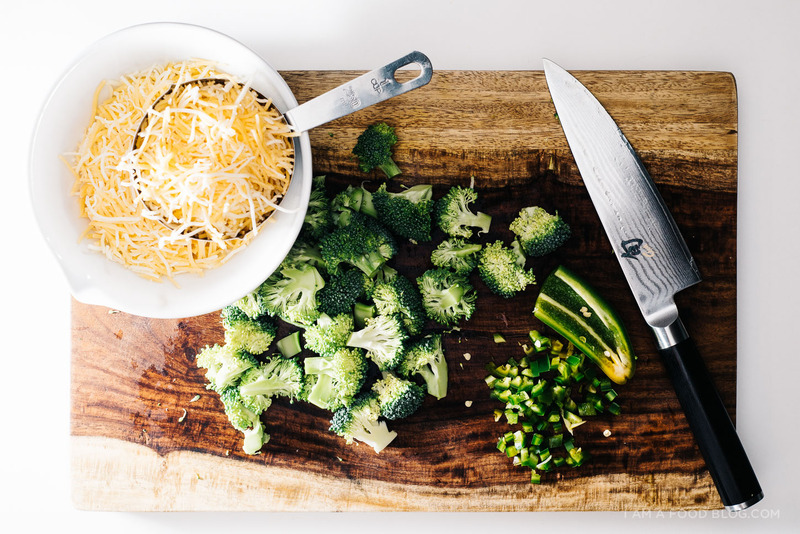 Even though I don’t like broccoli, this recipe look absolutely delicious! I will definitely try this at home! Wow, this looks delicious! I have never thought of putting jalapenos in it! This is just what I was searching for! I will be making this on Saturday and I bet it is wonderful. Thanks! This is now my fav Mac-n- cheese! I made it twice in one week because my husband wanted more. Love, love, love!! !